Skip this bit if analog creeps you out: The 555 timer has some analog circuitry that seems to be used in the majority of its applications. There is a control voltage (CV) pin that sets thresholds for comparators at the TH (threshold) and /TR (trigger) pins. If TH is above CV, then it registers as high (low otherwise); if /TR is below CV/2, then it registers as low (high otherwise). CV can be set externally, but usually it’s left alone, and its default setting is CV = 2Vcc/3 (making CV/2 = Vcc/3). Even if you ignore for a moment the tweakable threshold voltage settings on the threshold and trigger inputs, the 555 has interesting possibilities as a digital circuit. The chip has three logical inputs. One, /RST, is a legitimate TTL input that is inverted. The others feed into comparators as just described, but ignoring the level details, TH simply feeds into a buffer and /TR pin feeds into an inverter. There are also two outputs, OUT (output) and DIS (discharge) pin. Both carry the same data, but OUT is driven as a logic level while DIS is open-collector. If you ignore the /RST, the 555 is an R-/S latch, where TH and /TR pins serve as R and /S, respectively. If both of those signals are active, the result is by definition undefined. /RST adds to this an overriding additional reset signal. When active, the output is defined as low even if /TRis also active. The latch is set if /TR is low and /RSTis high. The latch is reset if THis high, /RSTis low, or both. As noted before, if /RST is high then TH and /TR form an R-/S latch. If TH is low, then /RST and /TR form a kind of R latch, with /RST and /TR as /R and /S, respectively. If TH and /TR are tied together as a single input, and /RST is used as another input, the result is an “AND NOT” logic gate, with TH+/TR as the inverting input and /RST as the non-inverting input. With /RST tied high, this becomes a Schmitt-triggered inverter. Of particular interest is the R latch. This particular latch is set when /TR is low and /RST is high. On the other hand, this latch is reset when /RST is low with no other condition. When I saw this it seemed a bit familiar, like /RST being high enables the value of /TR having any impact. So, I prepared a truth table for the D and E lines of a D latch, and entered the corresponding values of /R and /S. The result: /S = /E, and /R = D or /E. My first conclusion is that, if you’re not bound to using only 555 elements, this could make things a lot easier. It requires an active-low /E, if that can’t be accomplished anywhere else, an NPN inverter (one transistor, two resistors) will suffice. 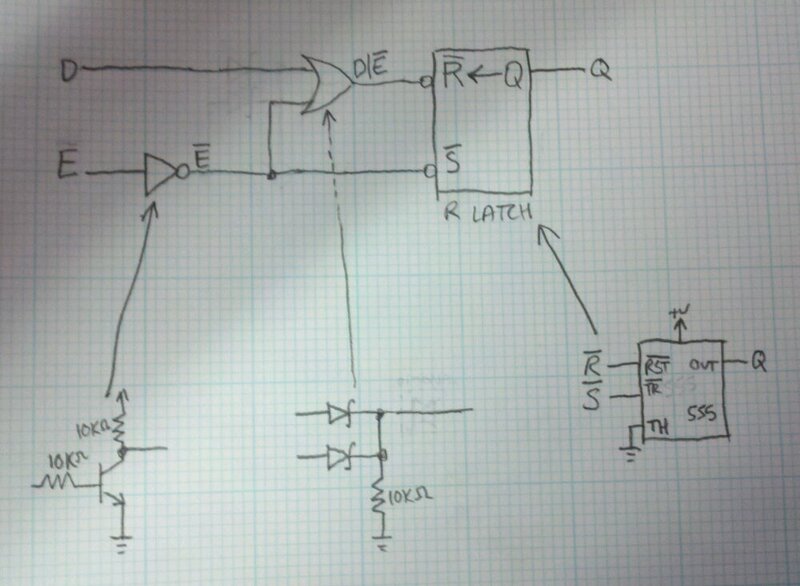 /E is fed directly into /S, and a diode-logic OR gate (2 Schottky diodes, one resistor) figures /R. Even with the inverter that’s way fewer parts than yesterday’s solution. In four parts, a D latch with active-low enable. Slap an inverter (also pictured) onto the front to make it a normal enable. Translating the setup to all 555s is trickier. If you can set up for active-low both /E and /D, it’s possible to get it down to three elements: The latch, an inverter into /R, and an AND NOT gate. This follows from the proposition that R = /D and E = /D and not /E. Then, /R = not R. And, of course, for active-high D you add an inverter—4 elements, no better than yesterday. Note that in the last stage there are three “AND NOT”s and no other operators. Note also that, using (Schottky) diode logic, the parts count is the same: Two diodes and one resistor. Guess which one I’d rather breadboard.